Drinking water at the end of a meal is akin to drinking poison. It kills the Jathaaragni (that aspect of prana or energy which enables the body to digest food) thereby making the food rot inside the system instead of getting digested. This in turn leads to excess acid and gas being produced in the system and a very vicious cycle starts. Mharishi Vagbhat has identified 103 ailments that occur as a result of drinking water after having eaten food. The minimum gap between food and water should be between 1.5 to 2.5 hrs. This also varies based on geographic and other conditions and the duration is higher in the mountains and lower in plains and hot areas. This is because the body’s ability to digest food varies with the ambient conditions. Water to be drunk before food should be drunk at least 45 minutes before having food. To clean the mouth and throat after food only one or two sips of warm/luke warm water can be had. If really thirsty, one can have fresh juice of seasonal fruits after morning meal and Buttermilk/Chhaas after lunch. Milk can be had after dinner. Though these also contain mostly water, the properties are completely different and they actually help digestion and the body instead of hurting it. Always drink water sip by sip like one drinks hot tea. The first thing to be done in the morning is to drink water. It is to be had warm at body temp and should be sipped like hot tea so that maximum saliva goes into the stomach. The person should drink water while sitting in Kagasana(Crow-Pose). Only if you are drinking water kept in a copper pot it need not be warmed up as it already has same quality as warm water. Mud pot water is also to be warmed up. Never drink cold water. It should always be Warm/Luke Warm or at body temp. Water should always be drunk warm/Luke warm. i.e. at the same temperature as the body. In case you are regularly taking in water kept in copper pot then you should stop for a couple of weeks after 3 months of continuous usage. Drinking cold water leads to decrease in blood supply to various organs. Over a period of time this leads to the weakening and hence failure of various organs and causes probs like heart attack, kidney failure, brain hemorrhage etc. Drinking chilled water leads to severe constipation, Large intestine shrinks causing various other complications. This is applicable to other cold foods as Below 18 and above 60 should drink only 1.5 to 2 glasses while others should drink upto 1.25 ltrs. i.e. minimum 3 glasses. This is the only water one should drink without feeling thirsty. Sip should be smallest. Try this for 6 months and see the changes in health. You will experience fresher, lighter, sleep will improve, improve digestion etc. The container in which drinking water is stored plays a very significant role to get more benefits . Glass/Tumbler is the most commonly used vessel. But in shape it is uniliniar which is not good. Lota is much better. Water takes the properties of its holding object and solutes. Lota is a sphere hence its surface tension is less. This is better for body. Well water is much better. Sadhus don’t drink water if its not from a well. Main property of water is cleansing. This is possible if the water you drink is of low surface tension. Example of milk used for cleaning skin. Same happens with intestines. By drinking water early in the morning, the stool gets cleared completely. The constipation vanishes and the heat generated in the night, gets cooled off. 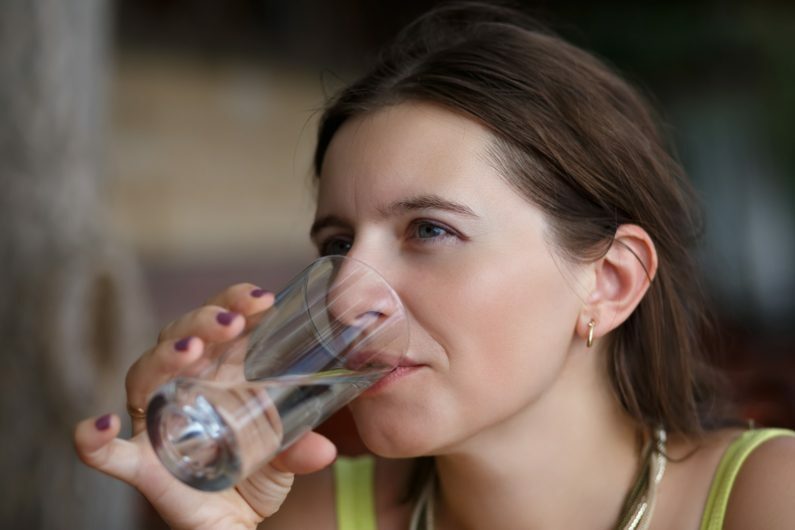 The health experts say that every individual must drink 10 to 15 glasses of water in a day in all seasons. The water washes our stomach and the blood reaches to the digesting organs. This increases the immunity of the body to fight diseases. Water plays an important role in stabilizing the temperature of the body. Water reaches in the form of blood to all parts of body and stabilizes the temperature. Water increases the working capacity of Kidney, lungs, skin and digesting system. By consuming enough water, the sweat, urine, stool and other waste materials come out from the body regularly. As per the Ayurveda, ushapan is as good as Amritpan.